Monday, May 15, 2017 marks the 76th anniversary of the beginning of Joe DiMaggio’s record 56-game hitting streak, which ran from May 15 to July 16, 1941. The streak ended On July 17 when he went 0-for-3 against the Indians, with third baseman Ken Keltner making two outstanding plays to stop the streak. 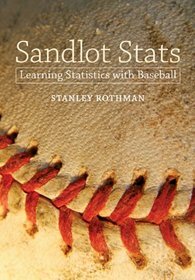 In Chapter 16 of my book, “Sandlot Stats: Learning Statistics with Baseball,” I developed a new formula which uses a player’s seasonal batting statistics to assign a probability of that player duplicating any batting streak. Then I apply my formula to calculate which players had the highest probabilities of duplicating special batting streaks. Of course, the most talked about batting streak is DiMaggio’s 56-game hitting streak. Another interesting streak belongs to Ted Williams when in 1949 he reached base successfully in 84 straight games. Which streak was harder to achieve? My formula assigned DiMaggio a probability of .0001 (1/10,000) and assigned Williams a probability of .0935 (935/10,000) of achieving their respective streaks. This says that, using their batting statistics for 1941 and 1949, for every 10,000 seasons DiMaggio would duplicate his streak one time while Williams in 10,000 seasons would duplicate his streak 935 times. Clearly, DiMaggio’s streak was the harder to achieve. I also applied my formula to many other batting streaks such as the most consecutive games with at least one home run, the most consecutive games without striking out and many other streaks. If you are interested in seeing the mathematics I used to develop my formula and the players who actually own these records, please read Chapter 16—titled ‘Streaking’— in my book. 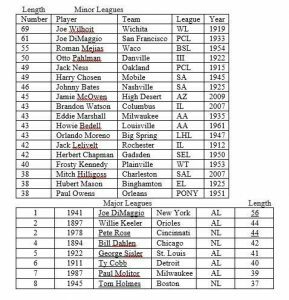 Below are the players with the longest hitting streaks in both the Major and Minor Leagues. Observe that Joe is the only player that appears on both lists. .408: DiMaggio hit .408 (91-for-223) during the streak with 15 home runs and 55 RBIs. .375: He entered May 15 (the first game of the streak) with a .306 batting average. That rose to .375 after the July 16 game, the final game of the streak. 4: DiMaggio faced four future Hall of Fame pitchers: Lefty Grove, Hal Newhouser, Bob Feller and Ted Lyons. 10: DiMaggio extended the streak in his final plate appearance 10 times, as Elias research notes. 16:DiMaggio started a 16-game hitting streak the game after the 56-game one ended. So he hit in 72 of 73 games total. In those 73 games, he had 120 hits, 20 home runs and six strikeouts. 44: The longest hitting streak since DiMaggio’s is a 44-gamer by Pete Rose in 1978. 29: The longest hitting streak by a Yankees player since DiMaggio’s streak ended is a 29-gamer by Hall of Famer Joe Gordon in 1942. Derek Jeter’s longest hitting streak was 25 games in 2006. Don Mattingly’s longest was 24 in 1986. Those are the three longest for the Yankees since DiMaggio.